It must take great strength of character for a researcher to publish data without recourse to the usual analysis and commentary. This compilation of stories from around the globe (but mostly from the U.S.) provides an eclectic mix of the supernatural and paranormal jumbled up together in no particular order. It provides plenty of entertaining ghost stories, to be sure, but also a reasonably sizeable database for researchers to get a feel for statistics and trends, as well as a reminder of the kind of totally off-beat stories which don't fit the mould and would otherwise never see the light of day. The lack of analysis in this unadulterated selection gives a researcher/book reviewer like me a bit of a field day, because the temptation is to pick up on any number of the short, quirky stories and attempt to explain them away, or categorize them into some kind of meaningful paranormal narrative. So, reviewing this book is rather like this scenario: We're at a paranormal conference run by Joshua Warren where an open-mike session takes place, and you're sat next to me listening to me twittering on about each case that comes up. Well, I'm sure you'd rather listen to the stories to yourself, and draw your own conclusions - in which case I'd thoroughly recommend you get hold of a copy and read on! Many of the stories occurred during the Twilight Zone period between sleep and wakefulness. The term 'Night Terrors' came up occasionally, and some of the stories did seem to be the extension of dreams into waking reality, often accompanied by sleep paralysis. As far as terror goes, I did notice a trend where what one might categorize as frightening supernatural events were experienced by observers of a more religious persuasion. So, these might involve encounters with dark creatures with glowing red eyes and evil intent whose overbearing presence invoked terror and an immediate 'fight-or-flight' response. Those less inclined towards religion (at least, in their response to any given incident) tended to have a less frightening paranormal encounter. One wonders whether this reflects an interface where religious-minded folk are actually more prone to receiving encounters from evil entities, with whom they do spiritual battle. Alternatively, perhaps the encounters themselves (whatever their objective source in reality) are coloured by the observer, and wrapped in their pre-existing subjective reality. In other words, if you're religious, then the on-going paranormal event is affected by your imagination based upon your view of the world; thus demonic or angelic encounters take place. If you have a more scientific world-view, then aliens and UFOs might become the order of the day (several tales of which feature in this book) as your mind tries to get a grip of the inexplicable event it's encountering. My academic considerations aside, quite a few of the supernatural encounters left the victim traumatised, both emotionally but sometimes also physically. They were intense events of profound importance to the person relating the story, which affected their life from the point onwards. They are, therefore, not to be dismissed lightly. "We lived in that house [in Lubbock, Texas] for three years (an old rock/petrified wood house built in the early 1940s) and had multiple odd things happen. My son began talking about odd things and described what he called "Mossums", beings that would come out of the sky and eat the lightning, along with several imaginary friends with whom he had very detailed relationships. Several times, things like a sippy-cup or playing cards would fly off counters and shelves. Banging noises on the side of the house would be loud enough to make the house vibrate. I'd get scared and grab my pistol to go search for whatever was making the noise. Friends of ours pulled up to the house one night and saw a black shadow man standing beside the driver's side door of our Wagoneer. He looked at them when they pulled up with their headlights on and walked off into the shadow of the house. The same friends saw a lady walking from our front door down the sidewalk on another occasion. "My husband and I have never fought so much as when we lived in that house. Previous owners of the property all ended up divorced. Apparently we got away in time." (p66, written by Ranetta Tyler). Also, encounters by automobile drivers weren't uncommon, where the driver and passengers were in difficult driving conditions, or lost, and then encounter somebody - or something - plainly out of the ordinary. In these instances, the spooky environment or conditions clearly play their part in providing fertile grounds for the imagination to go wild. Or, again, one might consider the possibility that we open up to such events at times of stress that otherwise we subconsciously guard against or phase out in our normal, everyday lives. Many of the accounts stem from frightening childhood encounters, which the experiencer still remembers as if it was yesterday. The profundity of the experience is not in doubt, but one can readily argue that the fertile imagination of a youngster was at least partly to blame. Now, is this because a child's imagination (a way of trying to understand and assimilate the world around them) is wholly to blame, or is it that children are naturally more susceptible to such encounters (which actually do have an objective reality) because children have not yet put in place a filtering mechanism to sift them out? We all see things in the corner of our eye, after all - what matters is what the mind does with these events. Adults might stop them in their tracks, whilst kids (especially spooked-out kids in the middle of the night) might launch off into an immersive netherworld of their own making. I'm always struck by stories of synchronicity, and psychic happenings. There were several accounts of times when the experiencer and/or other family members were contacted by phone/vision/unexpected thought by a loved one shortly after the time that the person had died. A plane crash which, thankfully, did not lead to fatalities featured in a similar tale (p20). My favourite story was the one related by Bart Ringer, a cop who had turned his psychic abilities to crime-busting in Riverton, Wyoming in the later 1970s, with unexpected consequences (pp197-201). Another story related to the chance (?) discovery of a previously lost personal effect belonging to a recently deceased loved one out in the middle of nowhere on a hiking trail (p242). Another involved the sudden desire to take her own car, thereby avoiding a bad crash (p177). There was only one case from the U.K., which struck me as odd given the haunted nature of much of these Isles. It related to a Manchester man who saw an impossibly tall, dark stranger moving effortlessly along a row of houses one night, blocking the light from windows set at various heights as 'he' went about his spooky tour (p127). Regrettably, I think this encounter was simply attributable to a rogue black bin bag carried on the wind - an explanation one could also apply to a similar experience described on p157. Black bin bags on the wind have also been the source of many 'UFO' encounters down the years. While its easy to categorise encounters, some were out of the ordinary and often extremely puzzling. One observer witnessed what he described as a 'pterodactyl (p78) fly past his window at close range. Maybe this was a particularly large heron, or something similar, catching the light in a weird way, I don't know. Other encounters involved bizarre monsters or entities straight out of an H.P. Lovecraft novel. One writer, then living at Wright-Patterson AFB, described his experiences of a reptilian entity which he labelled as an Anunnaki (p105). The celebrated Chupacabra cropped up once or twice, as well as Bigfoot-style off-shoots appearing in rural backwaters. These remind us that the world might still harbour creatures unknown to science, as fearful of us as we are of them! So, as you can see, a real mix of stories in this book, providing a great read for a stormy, autumnal evening! 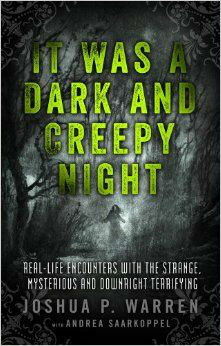 Subtitled: "Real-life Encounters with the Strange, Mysterious, and Downright Terrifying"